As the world-wide community in general and the Ukrainian-American community in particular marked the 5thanniversary of the slaughter of the innocent victims of the “Heavenly Hundred” on Kyiv’s Maydan in February of 2014, the spiritual center of the Ukrainian Orthodox Church of the USA in South Bound Brook, NJ became a place of a profound prayerful reflection about the tragedy and the need for the community to engage itself in the promotion of the sacredness of life and its protection. Pokrova Sisterhood Social Hall of the Metropolia Center became a place of a solemn reflection, as those in attendance viewed the images of the lost men and women of the Heavenly Hundred. 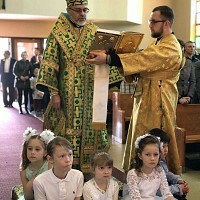 The event was organized by the Consistory of the Ukrainian Orthodox Church of the USA in cooperation with the Ukrainian History and Education Center, benefitting the Pirogov First Volunteer Mobile Hospital (PFVMH), which is the largest nongovernmental project involving civil health professionals in the provision of medical assistance in the zone of Joint Forces Operation (formerly “Anti-Terrorist Operation”), which is carried out in certain districts of Donetsk and Luhansk Oblasts of the Eastern Ukraine. His Eminence Archbishop Daniel, in the presence of Metropolitan Antony, opened the Memorial exhibit of the icons, written on ammo boxes, which were brought from the combat zone, and once painted, delivered to the United States of America for the exhibition and charitable sale. This exhibit-sale is set to benefit the Charitable Foundation “Pirogov First Volunteer Mobile Hospital” which exists in cooperation with the Health Ministry of Ukraine, the Defense Ministry of Ukraine and the General Staff of the Armed Forces of Ukraine with support from the National Security and Defense Council of Ukraine. Archbishop stated that during its operation in the ATO/JFO zone, the PFVMH has provided timely and skilled medical care to over 56,000 patients. The hospital has been stationed in 49 locations of Donetsk and Luhansk Oblasts – in cities and villages as well as in the field and at checkpoints on the contact line. Introducing Gennadiy Hruzenko, the acting president of the PFVMH, Vladyka Daniel offered the sentiments of gratitude of everyone in attendance for the important charitable work done in providing care for the wounded soldiers and their families. Mr. Hruzenko stated that in the fall of 2015, the PFVMH extended its activities to peaceful regions of Ukraine and performed unprecedented cardio screening in the Khmelnytsky region, which covered 22,433 persons in 565 localities. “We believe that our experience in combining the volunteer movement’s enthusiasm and flexibility with the state’s systemic and strategic approaches is turning the PFVMH into a unique project that is laying the foundations of future accessible and highly effective mobile medicine in Ukraine. Nov. 30, 2013 – Voluntary mobile teams formed to provide first aid to wounded participants in the Revolution of Dignity. January–February 2014 – Underground hospitals established by activists treated over 150 participants in the Revolution of Dignity, including those with ballistic traumas. March 2014 – Working out combat medical aid skills at the Sniper firing ground near Kyiv within the Ukrainian Reserve Army initiative. “Buy an Icon – Save a Life” is an art project of Kyivan artists Sofia Atlantova and Oleksandr Klymenko aimed to support the Pirogov First Volunteer Mobile Hospital (PFVMH), a non-government project that employs civilian medics to provide medical aid to both militants and civilians in the Anti-Terrorist Operation (ATO) zone in Eastern Ukraine. Exhibitions of the icons on ammo boxes, brought from the combat zone, have already been held at the European Parliament, Parliaments of Ukraine and Lithuania, St. Sophia Cathedral in Kyiv, Kyiv Pechersk Lavra, and the Lithuanian Embassy in Ukraine. 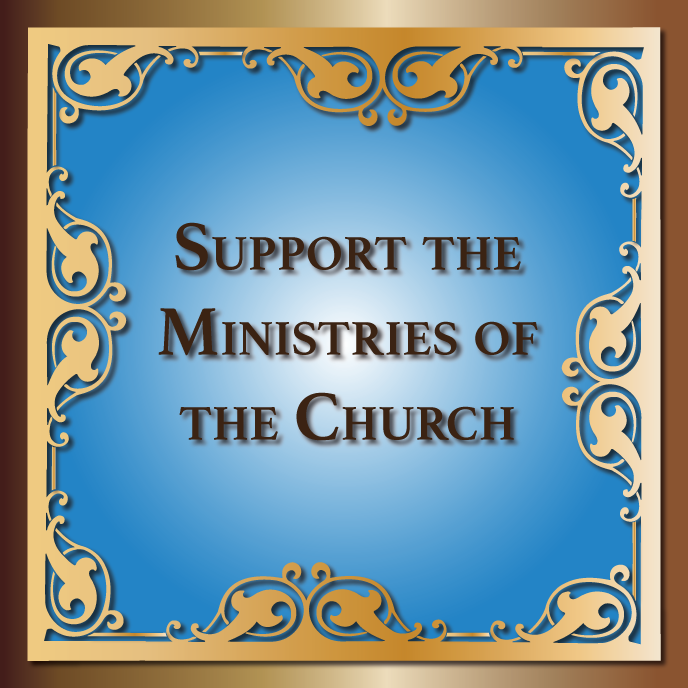 The icons have been displayed in The Hague, Antwerp, Berlin, Frankfurt am Main, Munich, Hanover, Leipzig, Bonn, Cologne, Warsaw, Vienna, Lublin, Prague, Rome, Milan, and Catania on Sicily, Los Angeles, Edmonton, Winnipeg, Toronto as well as the Ukrainian cities of Lviv, Lutsk, Mariupol, Dnipro, Peremyshl, Kamyanske, and Pokrovsk. Exhibitions of the icons on ammo boxes were also part of the 25th Economic Forum in Krynica, Poland, and the 8th Kyiv Security Forum, and were held in the University of Alberta in Canada, the Ukrainian Catholic University in Lviv and the Superior Institute of Religious Sciences of St. Thomas Aquinas in Kyiv. 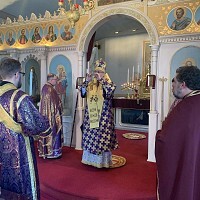 In profound silence, some 200 people walked through the isles of icons and portraits of the heroes of the Heavenly Hundred, while opening their hearts and offering donations for the icons in the exhibit, thus proving care and assistance to the Pirogov First Volunteer Mobile Hospital, wounded soldiers and their families. As everyone prepared to depart, a reflection was offered about the Ukrainian soldier, who died in a line of duty, leaving his child behind, who is in a major need of medical assistance.